MAGLITE XL200 LED Flashlight, Advanced Mode, high power 172 Lumens, NEW! Introducing the all New Maglite® XL200™ LED Flashlight ﻿THE NEWEST MEMBER of our XL™ SERIES of COMPACT FLASHLIGHTS offers FIVE BASIC, EASY-TO-USE FUNCTIONS plus Advanced Features and the STUNNING BRIGHTNESS of a Next-Generation LED. 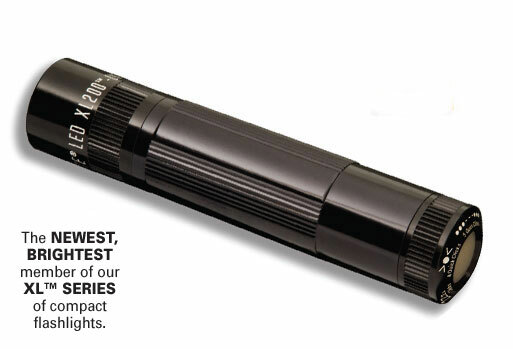 By the simple “QuickClick” method introduced with our popular Maglite® XL50™ flashlight, the XL200™ lets the user select the desired function. Motion-controlled variable power level and strobe rate. Notify me of updates to MAGLITE XL200 LED Flashlight, Advanced Mode, high power 172 Lumens, NEW!